Last Bruneaf, Marc Leo Felix gave a fantastic lecture about the history of the African art market. Structured by the decade, it’s a summary of how the West discovered African art – it offers a wonderful chronology peppered with many personal experiences, insights and opinions. Felix being an African art dealer (and much more than that) for more than 53 years, I can assure you this is a must watch. Note that the lecture is in French, but the good people of Biapal did the effort of providing English subtitles (available when you click ‘CC’ on the lower right bottom). This entry was posted in Opinions on September 30, 2015 by admin. 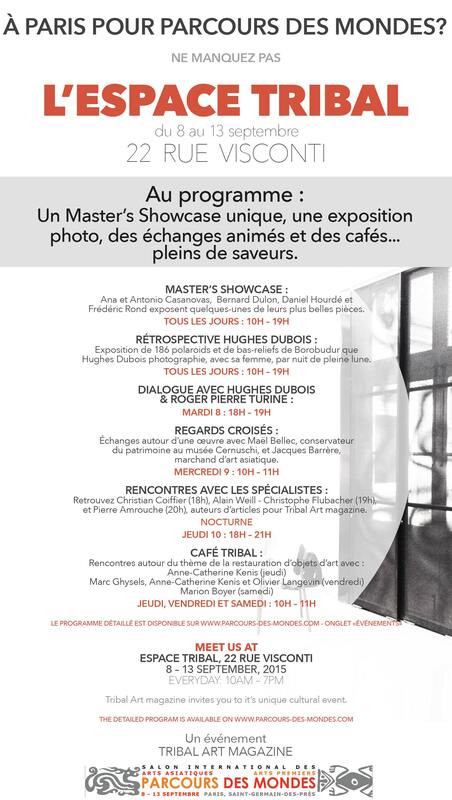 The 14th edition of Parcours des Mondes again was a big success*. With a baby at home, I only spent 3 days in Paris, but I succeeded in visiting every gallery at least once. I had never seen the galleries so crowded on the opening day, and it was not uncommon to find more than a dozen collectors in one gallery at the same time, so I would say visitor numbers were higher than ever before. The dollar being in a better situation than last year (or should we say the euro in a weaker position) certainly helped attracting more US collectors than the previous years. *at least for the visitors, I’m not aware of the number of sales on the dealer’s end..
My favorite object in Paris was a Yaure mask presented by Olivier Castellano that succeeded in giving me goosebumps. As so many top Ivory Coast objects, it came from the Bediat collection. Not surprisingly it was sold immediately on the day of the opening for a six-number figure. Of an outstanding refinement, yet so simple in its rendering of the human face, this mask still haunts me after two weeks – in a good way. Probably one of the most talked about objects was an exceptional Kongo figure presented by Philippe Ratton. Still with all its original adornments intact and with its head slightly turned to the right, this statue was of a quality one normally only encounters in museums. As always, there were a lot of thematic exhibitions, although some dealers were honest enough to call their theme ‘Latest acquisitions’. As said in my review of last year’s edition (here), for most of us the fair is about discovery anyway. Still some dealers did the effort and succeeded in creating remarkable exhibitions. Personally, I was very charmed by Jean-Yves Coué’s Madagascar show, perhaps a bit too ethnographic for many, but with a selection of objects one rarely gets to see. Impressive as well, was the “Animals” show of Lucas Ratton, in both quantity as quality. Joshua Dimondstein was brave enough to show a selection of (nowadays not so popular) heddle pulleys from Ivory Coast, and, also from the US, Bruce Frank presented a collection of something what I guess only the specialists knew before: terracotta masks from Papua New Guinea. From Spain, David Serra had brought with him a collection of fascinating Lhoro bronzes. 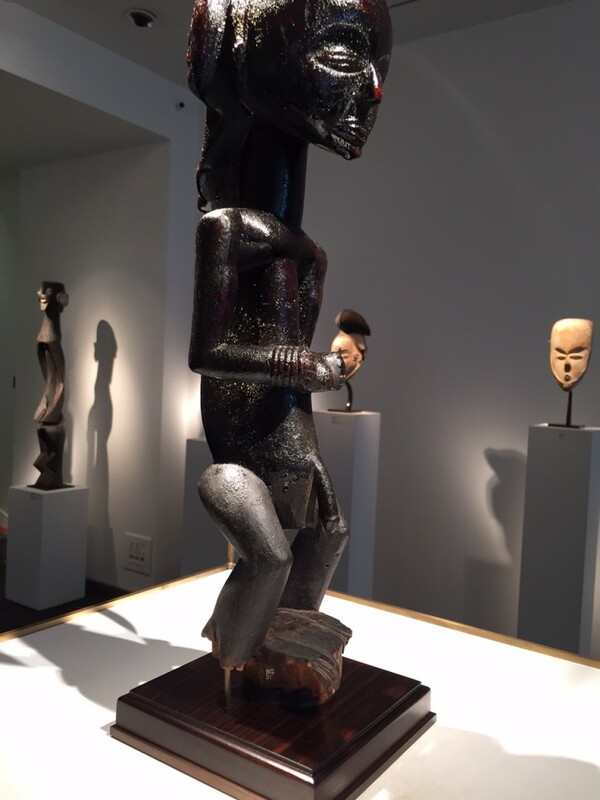 Good to see back was the Luba figure from the Warua Master (sold by Sotheby’s NY earlier this year; info), on view at Bernard Dulon – now without the ugly restoration of the feet and its oily patina dust-free, an improvement. I did miss Arte Y Ritual, who were not participating this year and usually a must-see, but Martin Doustar filled the hole they left and put up an impressive mask show in their old space – unfortunately with one of the star pieces still stuck in customs. 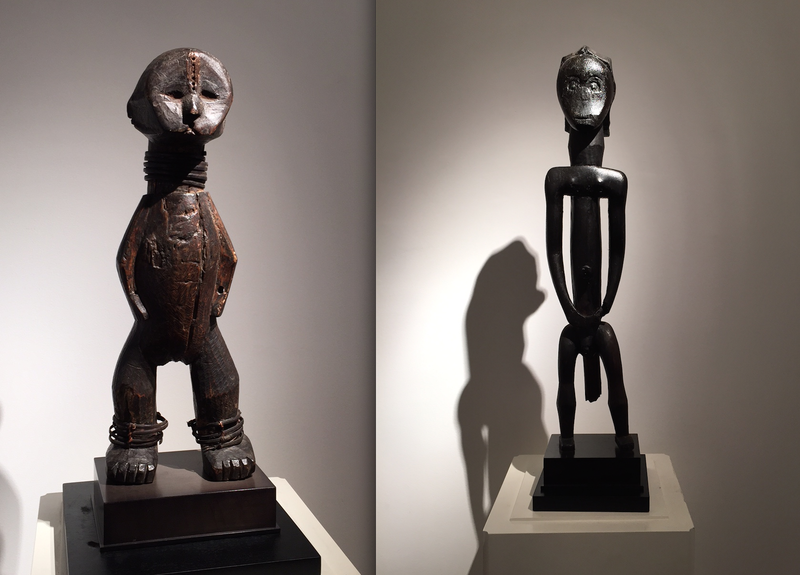 Across the street, Bernard de Grunne had brought a small but outstanding selection, including a blocky and powerful Northern Congolese statue, which was juxtaposed beautifully with a slim elongated Fang figure – a view I will not forget quickly. As said earlier here, this year was the first edition that included galleries specialized in Asian art; twenty renowned dealers with specialties in Chinese, Japanese, Himalayan, Indian, and, Southeast Asian art were exhibiting, so there was a lot extra to see. Most of what I saw was of an outstanding quality and especially the galleries of Marcel Nies and Jacques Barrere left a strong impression on me. I did see African art collectors going into the Asian art galleries so the interest definitely was there – but since I don’t recognize the Asian art aficionados, I don’t know the statement holds true the other way around. 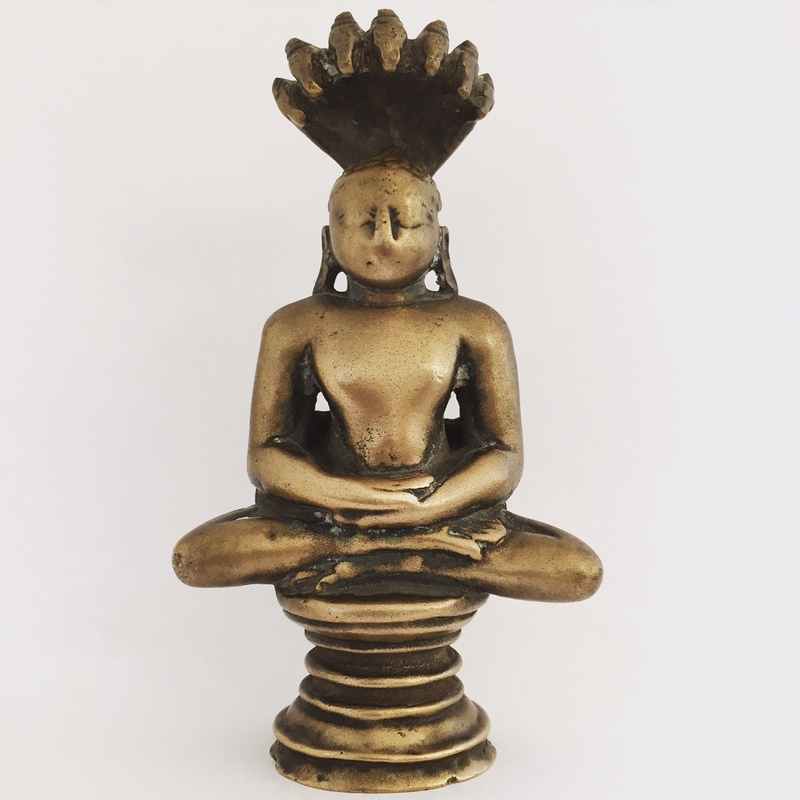 Anyway, a sign of the success of the fair’s enlargement might be the fact that yours truly brought home a 13th century Indian bronze purchased from Frederic Rond – who is based in Alain Lecomte’s old gallery (and thus on familiar territory). Parcours des Mondes (which means ‘Journeys through Worlds’) this year thus was truer to its name than ever before. It was, again, a flawless edition, so many compliments to its organizers for all the hard work behind the scenes. Parcours through the years has become much more than just an ‘open doors’-type event; it has become the start of our ‘season’ and the place where one sees one’s friends back in the beautiful Parisian quarter that is Saint-Germain-des-Prés. This entry was posted in Fairs and tagged Fang, Luba, Yaure on September 23, 2015 by admin. 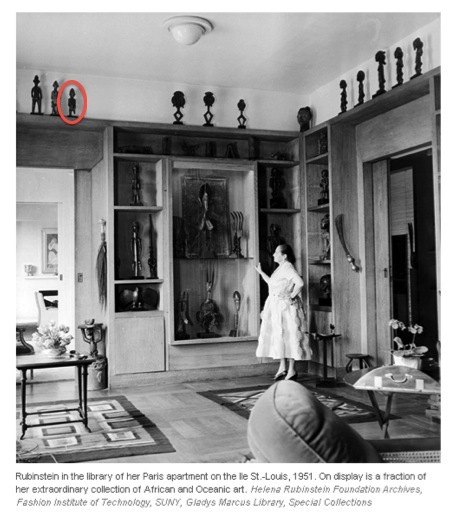 An important momentum in the appreciation of African art was the sale of the Helena Rubinstein collection by Parke-Bernet Galleries Inc. in April 1966. The unprecedented prices paid for the objects from her collection would radically alter the commercial value of African art. Ever since, and even more since the 2014 exhibition dedicated to her (info here & here), objects coming from her collection have been highly sought after. Last weekend, one of them popped up in an small US estate auction. An attentive collector discovered it on the above interior photo and was able to acquire it at a fair price. A wonderful detail is that after being cherished so long by the most important female collector of the 20th century, it will now be treasured again by another female collector, a species of which there are far too few. This entry was posted in Objects and tagged Senufo on September 21, 2015 by admin. 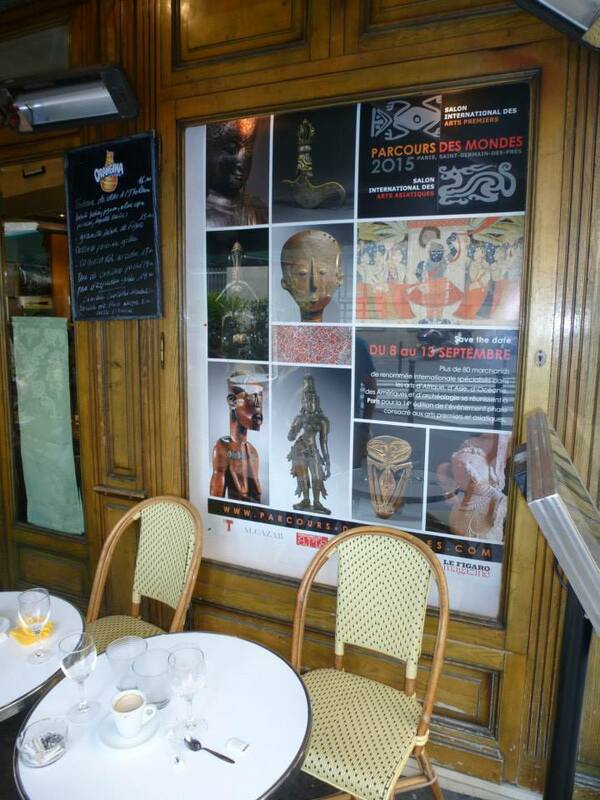 From Tuesday 8 to Sunday 13th September, the charming Paris Saint-Germain-des-Prés quarter again welcomes the crème de la crème of the international tribal art scene for the fourteenth edition of Parcours des Mondes. While last year the organization increased the representation of the arts of the antiquity and archaeological material, they keep expanding the scope of this event by now also including dealers specialized in Asian art. They hope to attract an even wider public to the fair and takes into consideration the already existing interest among the regular visitors. Twenty renowned dealers with specialties in Chinese, Japanese, Himalayan, Indian, and, Southeast Asian art will be exhibiting. Parcours des Mondes (which means ‘Journeys through Worlds’) this year will be truer to its name than ever before. Kudos for the organization! One thing is sure, and that is now definitely impossible to see everything in one day. I hope three will be enough, but I’m afraid not. For me it will be the eight time I visit Parcours, it’s really a not to miss event. If you haven’t visited it yet, you definitely should consider; you’ll regret not having done it earlier. You can browse the catalogue here. Under the banner L’Espace Tribal there is also a wide variety of side activities. I’ve already written about the Hughes Dubois retrospective (here). There’s also an exhibition with a small selection of masterpieces at 22 Rue Visconti and several opportunities to meet authors and experts, see the whole program below. ps Sotheby’s and Christie’s both also will be showing a preview of their December sales. This entry was posted in Fairs, News on September 7, 2015 by admin. J.D. ‘Okhai Ojeikere (Nigerian, 1930–2014) – Untitled (Mkpuk Eba), 1974. Gelatin silver print. Image courtesy of the The Metropolitan Museum of Art, New York, (2010.168). A personal selection of some news items I encountered last month.. The rich tradition of portrait photography in west Africa is explored in a new exhibition at the Metropolitan Museum of Art (info). 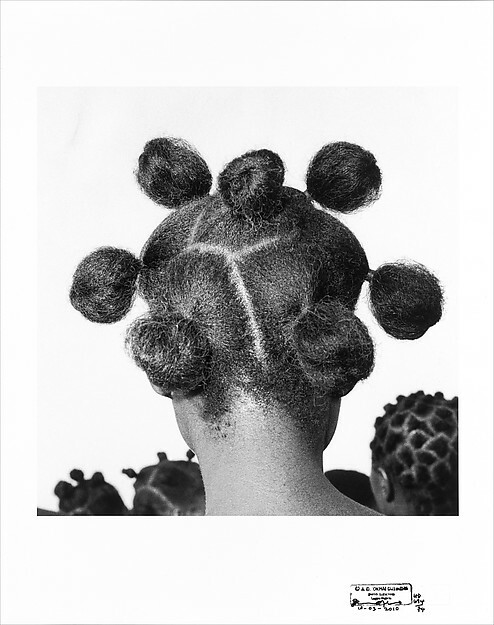 In and Out of the Studio showcases over 80 images taken from the 1870s to 1970s, ranging from casual shots to formal portraits, and features some of the stars of west African photography such as Malick Sidibé and Samuel Fosso. The exhibition runs 31 August to 3 January. At the Brunei Gallery in London’s School of Oriental and African Studies the exhibition Missionaries and Idols of Polynesia still funds until 26 September; David Attenborough stated it was profoundly emotionally moving, from every point of view. More info (and pictures) here. The first stone of the new National Museum of Congo in Kinshasa will be laid this year; a delegation of experts of South-Korea visited the site last year – the works should have to be finished by 2018 (info, in French). Strong winds had blown off parts of the roof of the reserves in 2011 and 2014, exposing thousands of works to rain. 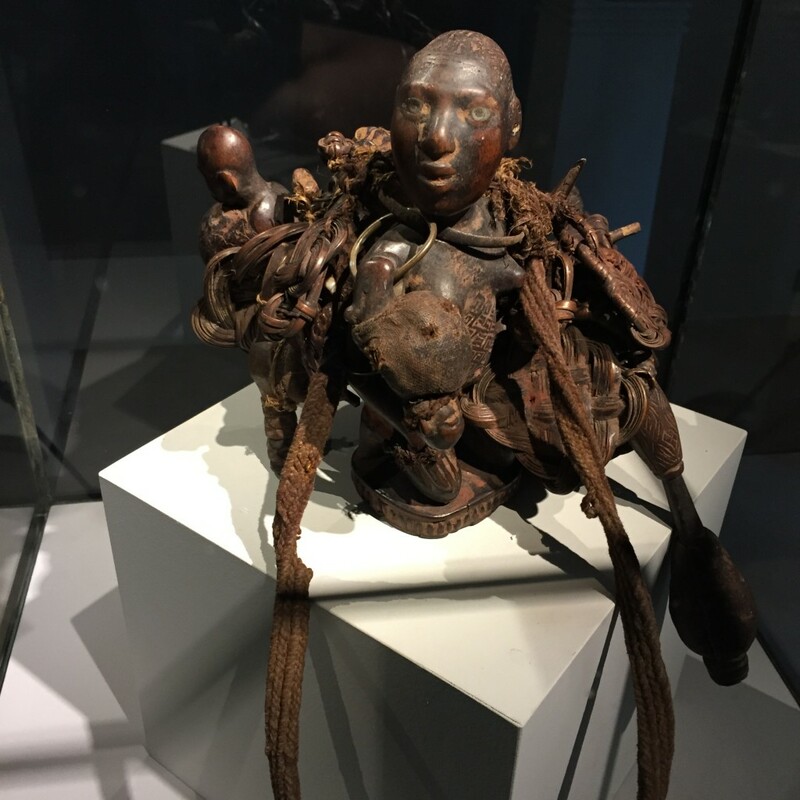 The Musée de Quai Branly in Paris has organized a virtual visit of their current exhibition, Maîtres de la sculpture de Côte d’Ivoire, via videoconference. Using a smartphone and two tablets, a select public in Abidjan could follow the visit and learn more about their national heritage – more info here (in French). The record sales at the Paris offices of Christie’s and Sotheby’s unsurprisingly did attract some media coverage. Here Pierre Amrouche shares his insights. 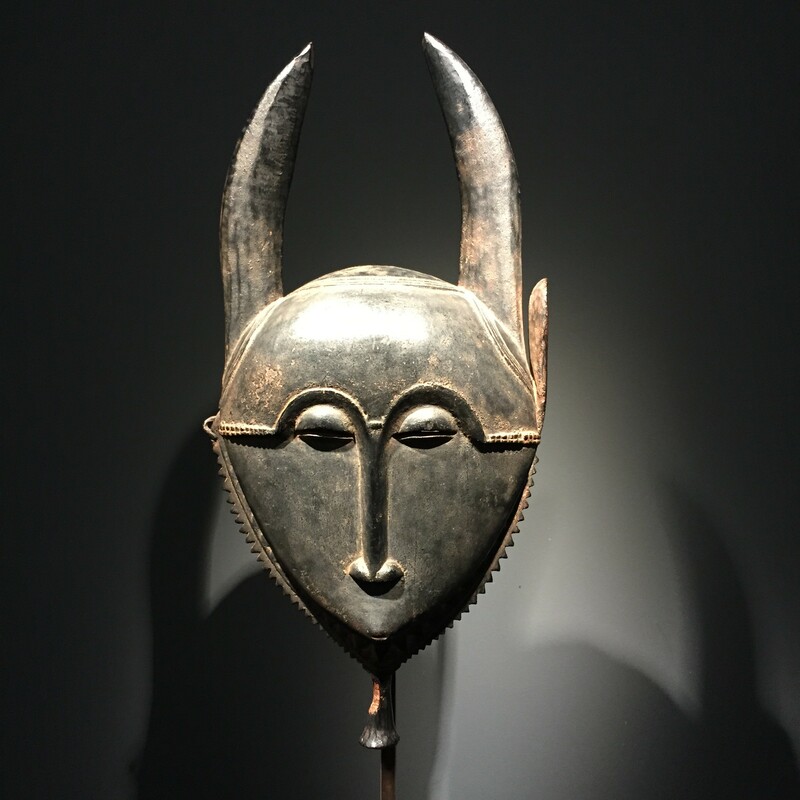 The friends of the Musée du Quai Branly have bought the rare Attié mask that was sold by Sotheby’s Paris in June; a great addition to the museum’s holdings. Sotheby’s Paris will be selling a selection of 10 African art objects from the Murray Frum collection, highlighted by a wonderful Luba staff. Across the ocean, Heinrich Schweizer is no longer at Sotheby’s New York. In St. Louis, Senufo: Art and Identity in West Africa (originally curated for the Cleveland Museum of Art by Constantine Petridis) has made its second stop. Read a interview with their African art curator, Nichole Bridges, here. In Arkansas, the Philander Smith College received 25 pieces of African art, supposedly worth nearly $ 1 million. I wonder who appraised them – you can find two pictures here. The renovation of the Royal Museum for Central Africa in Tervuren is still on schedule – see a short tour by the architect below. This entry was posted in News on September 1, 2015 by admin.